Eastern Iowa Community Colleges are a Military Friendly and Supportive school and dedicated to helping our Military/Veteran and family member students in their transition into the college environment. EICC offers military and veteran priority enrollment during the designated priority enrollment period for current students. New military and veteran students will be allowed to register as well. Eastern Iowa Community Colleges are dedicated to providing veteran and military students information and assistance with education benefits program through the Department of Veterans Affairs. Clinton, Muscatine and Scott Community Colleges have certifying officials on campus to assist in the registration and will certify education benefits. Academic Advisors are available to work with students in planning their coursework and faculty are on campus to work with students. Student success and degree completion is a priority for EICC. Eastern Iowa Community Colleges are a DOD MOU signatory establishment and also signed the compliance to the President’s Principles of Excellence . In addition, EICC was named one of the Home Based Iowa Certified Higher Academic Military Partners (CHAMPs) in 2015. Eastern Iowa Community College currently has many policies, procedures and practices that assist our military and veteran students. The colleges have had a long tradition of providing quality services including certification of Veteran Benefits, awarding of credit for military training, military deployment withdrawal policy and in-state tuition policy for military, veterans and their dependents. 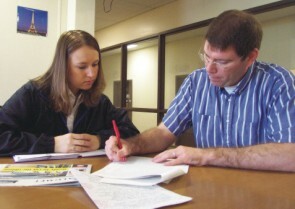 Each campus has a staff member that handles certification for VA and Tuition Assistance. EICC utilizes ACE credit recommendations along with faculty input to award credit for military training and courses. EICC has relationships with the Rock Island Arsenal, local National Guard Units and Local Reserve Units. EICC provides in-state tuition (Board Policy 507) to military, veterans and their dependents. EICC provides advising, financial aid, and job/career placement services to military and veteran students. EICC offers some scholarship opportunities through foundations specific to military and veteran students. EICC allows military personnel called to active duty to withdraw without penalty. (Student Handbook). EICC campuses provide or have provided military and veteran related activities and events. EICC has allowed military students to re-enter programs with limited enrollment without penalty. EICC has a Student Veteran’s Organization EICC Student Veterans Facebook group , Join us! EICC academic programs are well positioned to provide civilian credentials that complement military training. EICC’s flexible learning options, including online, evenings and short-term classes, are well positioned to serve the needs of military and veteran students. Registrar Office Staff have attended VA and military benefit training to keep updated with changing regulations. The Principles of Excellence was established by Executive Order 13607 in 2011. These guidelines are written to ensure that veterans' education benefits are handled properly, as well as providing support in their education endeavor and providing an environment that protects and ensures they receive what they have earned.